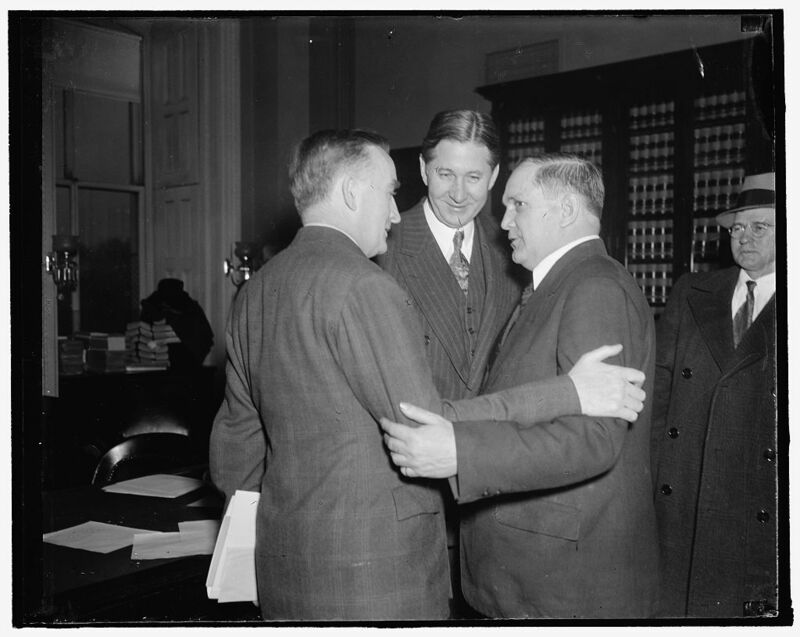 Senator Joseph C. O’Mahoney, (left) Senator James E. Murray, and John W. Jenkins, Chairman of the Tom Mooney Defense Committee, go into a huddle just before the Senate Judiciary Subcommittee opened its meeting today to hear a petition to summon Mooney to testify at hearings on a Senate resolution urging his freedom. James E. Murray served his uncle for nearly 20 years. It wasn’t pleasant work. When James A. Murray died, he had two provisions in his will. The first was written for anyone claiming to be his child. He denied paternity of any offspring, but if someone could provide evidence, they would be given $10 dollars. The second provision split his estate. He carried an envelope with shares allocated to family members, only to be revealed after his passing. His nephew James was granted the largest share of his estate though these certificates. James the younger eventually parlayed his inherited wealth into a successful political career. Truman and Murray enter the Senate. 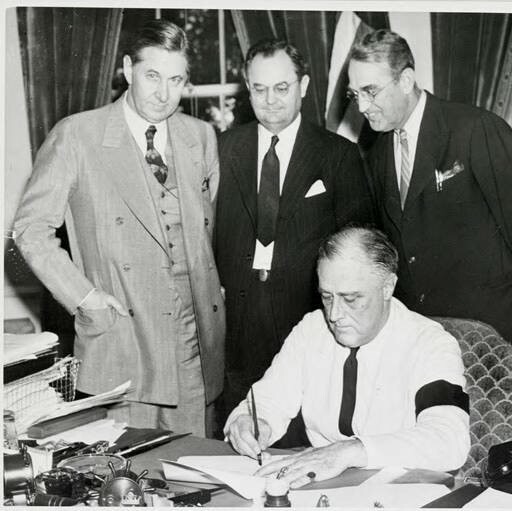 Senator Murray riding with FDR and Eleanor. Murray’s role as a champion for labor started in in Butte, Montana, for a time, the largest mining town in the world with the largest local union in the world. There, he worked for his wealthy uncle, James A. Murray, who took him in when his father died. The elder Murray was also champion for labor; he never had a strike in one of his mines, and in a remarkable move, funded the expansion of the Butte Bulletin, an organ for labor, when unions desperately needed a voice, which circulated throughout the western United States between 1917 and 1924. Stephen Kemp Bailey, Congress Makes a Law: The Story Behind the Employment Act of 1946 (Columbia University Press, 1950), 41. Edwin G. Nourse, Economics in the Public Service: Administrative Aspects of the Employment Act (Harcourt, Brace & Company, 1953), 340. Nourse was the first chairman of the Council of Economic Advisors. J.K. Galbraith, “Review: Economic Advice and Presidential Leadership: The Council of Economic Advisers,” The American Economic Review 56, no. 5 (December 1966): 1249–50. Lyndon B. Johnson, “Statement of the President Following Passage of the Medicare Bill by Senate,” July 9, 1965, http://www.presidency.ucsb.edu/ws/?pid=27072. Harry S. Truman, “President Harry S. Truman to Honorable Philip Murray,” Telegram, (October 1951), AFL-CIO Community Service Activities records, Box 17 Flat, folder 1, University of Minnesota, Elmer L. Andersen Library Social Welfare History Archives. Claude Pepper, “Claude Pepper to Honorable Leo Perlis,” Letter, (September 29, 1951), AFL-CIO Community Service Activities records, Box 17 Flat, folder 1, University of Minnesota, Elmer L. Andersen Library Social Welfare History Archives. Hubert H. Humphrey, “Senator Hubert H. Humphrey to Leo Perlis,” Telegram, (October 2, 1951), AFL-CIO Community Service Activities records, Box 17 Flat, folder 1, University of Minnesota, Elmer L. Andersen Library Social Welfare History Archives. “CIO-CSC Philip Murray Award Given to Sen. Murray,” The CIO News, October 8, 1951; “CIO President Murray Hails Social Welfare Record of Senator James E. Murray,” Press Release (Washington D.C.: Congress of Industrial Organizations, October 3, 1951), AFL-CIO Community Service Activities records, Box 17 Flat, folder 1, University of Minnesota, Elmer L. Andersen Library Social Welfare History Archives. David M. Emmons, Beyond the American Pale: The Irish in the West, 1845-1910 (University of Oklahoma Press, 2010), 15. Donald E. Spritzer, “New Dealer from Montana: The Senate Career of James E. Murray” (University of Montana, 1980), 10–13. Dorothy M. Thayer, “New Faces in the Senate – Montana’s Young Jim Murray.,” The Washington Post, November 23, 1934. Guy Halverson and William E. Ames, “The Butte Bulletin: Beginning of a Labor Daily,” Journalism Quarterly 46, no. 2 (Summer 1969): 260–66; George S. Gould Jr., “Report of Inheritance Tax Appraiser,” November 1, 1922, Probate Case File #3274, County of Monterey Superior Court. Former U.S. Senator Wheeler confirmed Murray’s funding of the Bulletin, but incorrectly assigned the investment to the start-up of the paper in December 1917. The record of Murray’s funding is contained in his probate documents and corresponds with the expansion of the paper in August 1918.